Dumpsty desktop dumpsters are ready for anything you want to throw at them… in them… or on them. Measuring a broad eleven inches across (the perfect size for magazines), and handmade from steel, they’re authentic recreations of their full-sized counterparts. 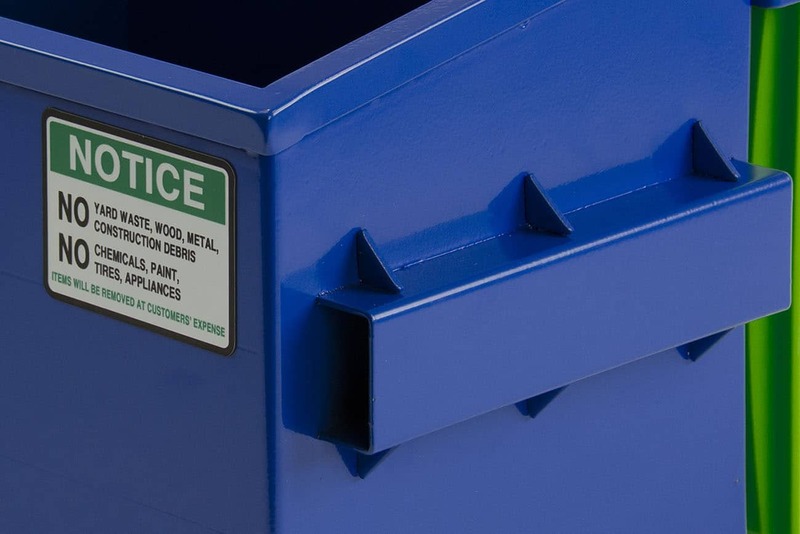 Blank Dumpsty dumpsters are available in raw galvanized steel or glossy blue or green paint. Keep yours factory fresh or stick it to the man with your own tags and artwork. View blank Dumpsty dumpsters for sale. When we put blank Dumpsty dumpsters in the hands of talented artists, the results are incredible! Dumpsty Artist Editions are true works of art. Each unique piece is created by hand and signed by the original artist. The perfect complement to any home or desktop. Dumpsty Artist Editions are singularly unique, but previously sold pieces live on in our gallery. We’re always on the lookout for talented artists to collaborate with. Drop us a line if you’d like to know more. A scaled down version of popular jobsite and tool storage boxes. Deskbox is ridiculously tough for its size. 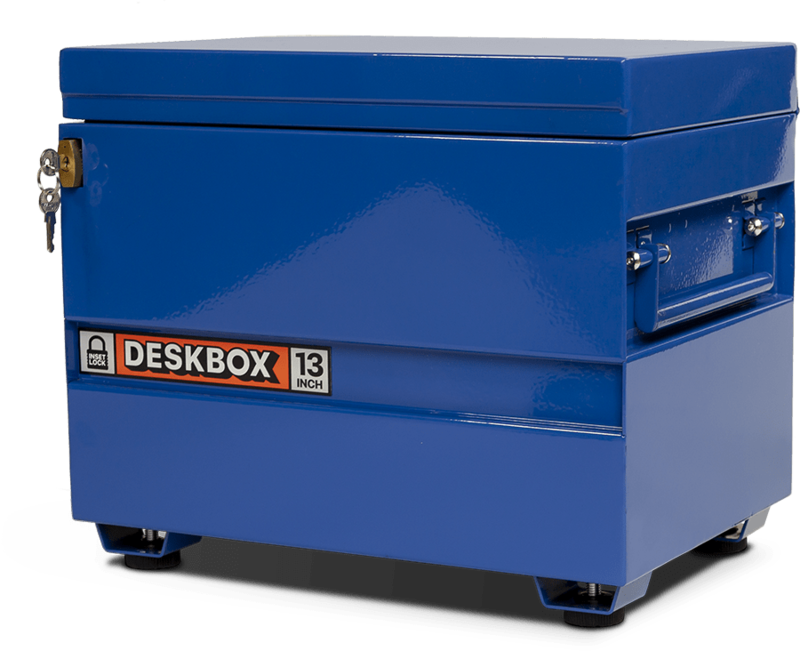 Made of steel and powder-coated in blue or tan paint, Deskbox includes the same features as a full-sized jobsite box including a recessed lock, locking lid bar, working side handles, and removable skids with rubber feet – yet it’s designed to fit neatly on your desktop. Authentic dumpster warning signage and a selection of replacement rubber lids in a wide assortment of colors to make your Dumpsty even more unique. Tired of the same old mugs and t-shirts? Give them something they’ll never throw away and always remember. Dumpsty desktop dumpsters are fun, functional, and one of a kind. 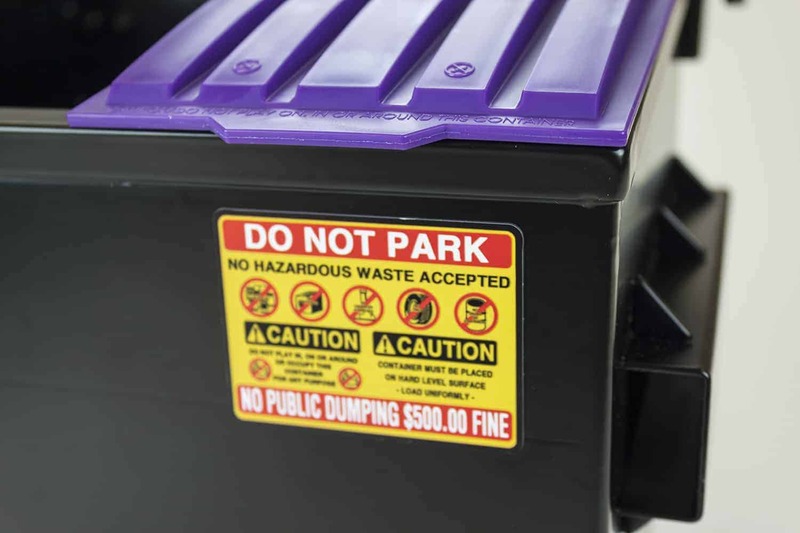 We can powder-coat your Dumpsty in any color and lids come in blue, green, purple, yellow, and black. For the finishing touch we can apply your logo to the front of Dumpsty in a large area up to 8x5 inches in size. Choose permanent stickers or super-thin magnets, which can be easily moved. If you need assistance with your artwork, we have a full-service creative department ready to help. 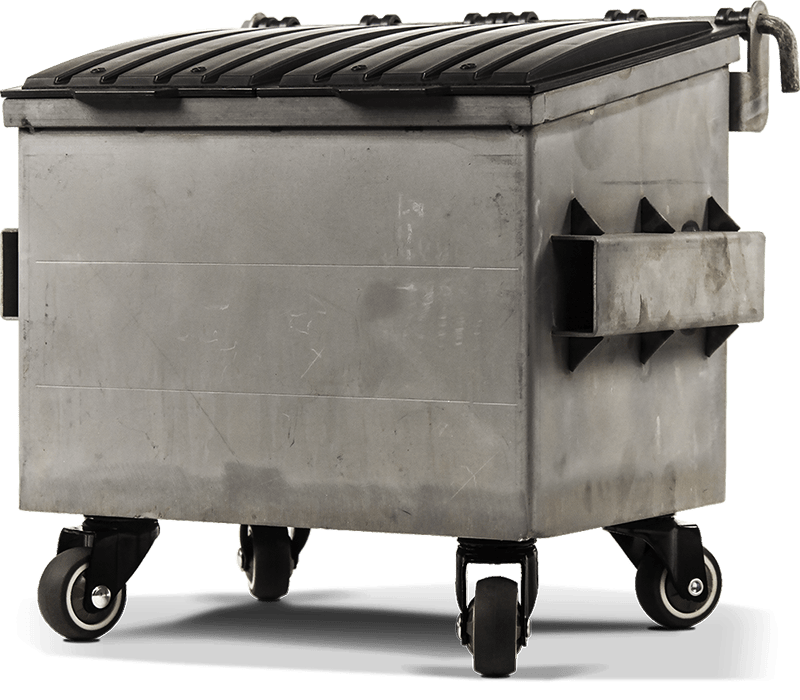 Contact us for more information on custom Dumpsty dumpsters. Dumpsty combines gritty realism, solid metal construction, and broad paintable areas to create a unique medium for artistic expression and experimentation. From the fork pockets to the tiny molded text on the rubber lids and warning signage; everything has been meticulously recreated down to the last detail. At eleven inches wide and ten inches tall, Dumpsty is just the right size for your desktop, workbench, or table. See full measurements here. 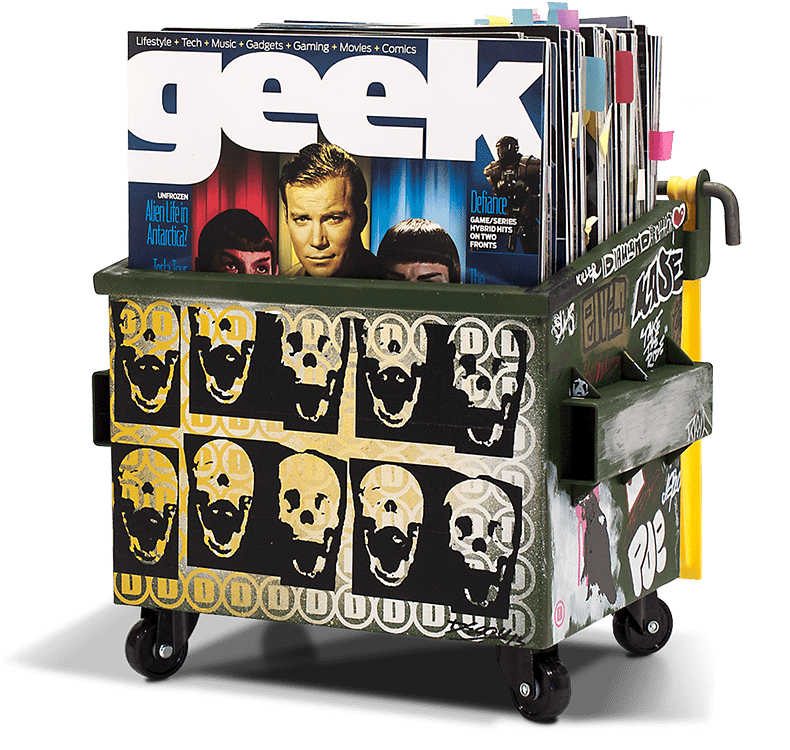 Measuring a broad eleven inches across and ten inches tall, Dumpsty is the perfect size for magazines, studio supplies, tools, and personal treasures. Independent rubber lids are available in assorted colors and held in place by the same rugged dog-ear hinge design found in full-sized dumpsters. Custom casters designed for Dumpsty use a double bearing design and super-soft polyurethane wheels for ultra-smooth motion. 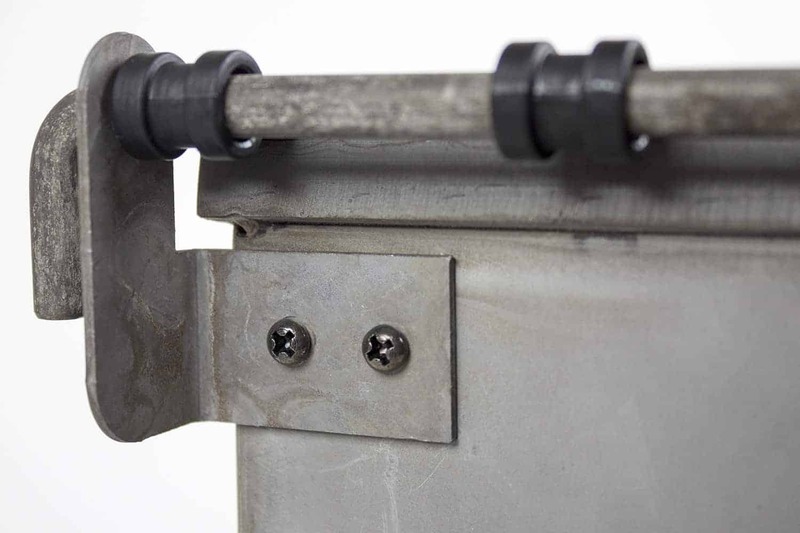 Dumpsty is solid – made by hand using heavy-duty recycled steel. 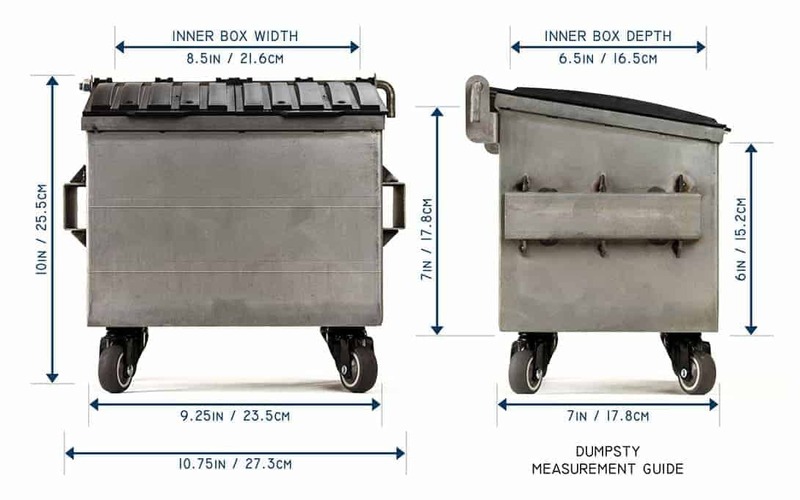 Dumpsty can take whatever you throw at it, in it, or on it – and look all the better for it.